India tops the list of charity recipients from private foundations while Pakistan is ranked as the 12th largest recipient of philanthropic giving in the world, according to a report released by OECD (Organization for Economic Co-operation and Development). Philanthropic contributions of major international private foundations in Pakistan totaled $267 million out of the $42 billion global contribution in 2013-2015. This compares with $1.6 billion in top-ranked India and $498 billion in second-ranked China. US-based Bill and Melinda Gates Foundation (BMGF) contributed nearly half of the $42 billion in global charity by private foundations. Private foundations are filling the huge gaps in public funding of health and education sectors in developing nations. . They contributed $11 billion for the health sector alone in the three year period, ranking third behind the United States and a global fund for fighting disease. In addition to being the biggest recipient of private foreign charity, India has been the number one recipient of official US aid since 1947, according to the US government data. The country India's first Prime Minister turned to for help during the 1962 China-India war was also the United States. India has received $65.1 billion in US aid since its independence, making it the top recipient of American economic assistance. Pakistan, with its $44.4 billion, is at number 5 on the list. 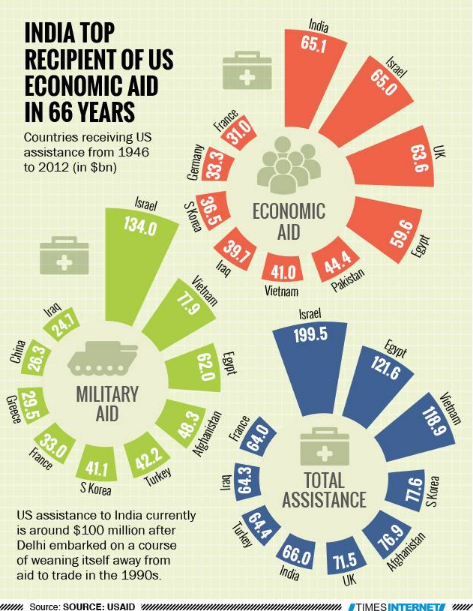 US data also shows that Pakistan is not among top 10 for military or total economic and military aid. Thanks for another informative piece. With regard to charitable giving in Pakistan, we at TCF monitor this closely. In recent years, the ratio of donations to TCF has been 60:40 (Pakistani v. overseas donors). As giving to TCF by overseas donors has increased, the ratio is still 50-50 (2016, 2017). Pakistan is focusing instead on the rollout of the next batch of the JF-17, the fighter jet it is developing with China, and which is catching up with the F-16 in terms of capabilities. Pakistan’s response encapsulated what had been a slow but steady shift in military procurement away from American-made weapons towards Chinese ones, or those made domestically with Chinese support. Since 2010, US weapons exports to Pakistan have plummeted from $1bn to just $21m last year, according to data from the Stockholm International Peace Research Institute. During the same period, those from China have also fallen, but much more slowly, from $747m to $514m, making China the biggest weapons exporter to its southern neighbour. The shift coincided with Islamabad’s growing suspicion about the closeness between the US and India, but was accelerated by the killing of al-Qaeda leader Osama bin Laden on Pakistani soil in 2011, which badly damaged relations with the US. This year, relations deteriorated again when President Donald Trump suspended $2bn of military aid to Pakistan, accusing it of showing “nothing but lies and deceit” in its promises to crack down on the Taliban and affiliated groups. The problem for Mr Trump is that he needs support from Pakistan as he recommits to the war in Afghanistan, and his officials are finding that Islamabad is less responsive than usual to the US message. Harrison Akins, a research fellow at the Howard H Baker Jr Center for Public Policy at the University of Tennessee, says: “The Trump administration’s decision to pursue sanctions against Pakistan, alongside Trump’s fiery rhetoric . . . can only push Pakistan further into the arms of Beijing — especially with Pakistan’s shift from US military supplies to Chinese military supplies. For the US, there could be longer-term consequences that stretch well beyond its complicated relationship with Pakistan. Sales of weapons systems, often backed by preferential financial terms, have become central to the way the US has managed its vast network of military alliances and partnerships — in effect, a form of patronage. But many of those countries are now advertising their ability to buy some of that hardware from other governments. Key allies such as Saudi Arabia and Turkey have signed arms agreements with Russia. From the Philippines and Thailand in east Asia, to large parts of Africa, world leaders are also increasingly looking to China to provide the kinds of weapons they always used to buy from the US. Between 2011 and 2015, China exported 88 per cent more in weapon sales than during the previous five years, according to Sipri. For Pakistan’s defence planners, the collaboration with China on defence technology is not only about equipping their own armed services. They are also hoping they can become a significant arms exporter and, in doing so, help to boost the country’s low foreign currency reserves. It stands in Mr Modi’s home state of Gujarat at the bend of the Narmada river. The Prime Minister was the chief minister of Gujarat when the statue was first commissioned. Construction began in 2012 when the UK sent India nearly £300million. Then, in 2013, the UK sent another £268billion followed by £278million in 2014 and £185million in 2015. Since then, the UK has sent India smaller sums. While this money was coming in, India was spending much of it to build the 579ft bronze replica of a hero of India’s independence movement, Sardar Patel. In response to this, Tory MP Peter Bone said: “To take £1.1billion in aid from us and then at the same time spend £330million on a statue is a total nonsense and it is the sort of thing that drives people mad. “What it proves is that we should not be giving money to India. The aid money was also spent on various programmes ranging from improving women’s rights to funding solar panels to investment in low-carbon transport. In 2014, around £14,000 was spent in Gujarat to increase religious tolerance among young people. While the UK did not directly fund the statue, the money was spent on programmes that the government could not have afforded if they had been using their own money on building the statue. It took 3,500 workers four years to build and it also saw a massive land-grab that affected 72 nearby villages that, according to tribal chiefs, forced thousand out of their homes. Upon its unveiling, helicopters flew overhead and dropped rose petals during Mr Modi’s speech. Britain’s former International Development Secretary Andrew Mitchell said in 2012 that the UK would stop ending India aid in 2015, but £92.6million was sent to India last year.